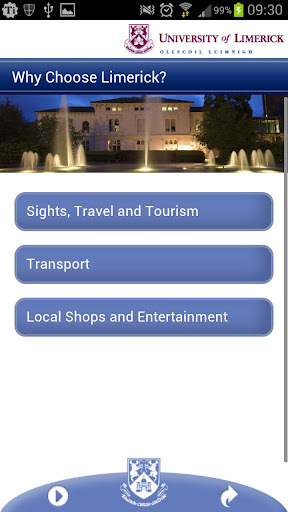 Loving the New University of Limerick App! Where to study Ireland Loving the New University of Limerick App! Over the course of the past semester, I have written blogs for i-studentglobal and shared my abroad experience with you. Now I’m working on my thesis from home in New Hampshire, but I have to announce something important. The University of Limerick has developed an app for smartphones. The new app is easy to use, clear cut, and helpful. It includes everything. From links to important resources and phone numbers on campus to maps and tips for the student living in Limerick, Ireland. And even check out the blog posts of current students at UL. 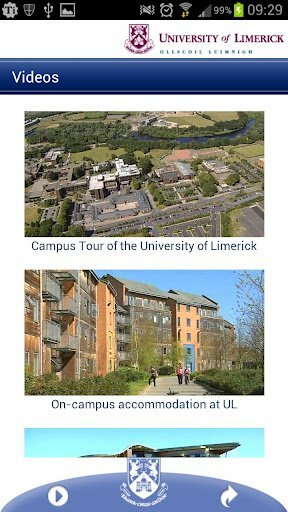 New current students can use the map of campus to find classes with ease; and the map of Limerick City, which includes specific pinpointed locations like the train station and King John’s Castle. Additionally, the app includes pictures and videos which allow prospective students to take a look at the campus via picture and video tours. This is particularly important for prospective international students who may not have the financial means to tour the campus in person before deciding UL is the right place for them. Prospective students can explore the campus without having to even open their laptops and type in a URL. There are links to Facebook and Twitter, giving students more alternative methods for “getting to know” UL. I had to carry all the paper maps, got lost on campus a few times and had to search the UL website via computer for important numbers and facts. So I think it’s great that future students can access such a helpful app. Oh, and did I mention that the app is free?